We are happy to welcome new members to our Catholic faith community. Infant Baptisms are usually celebrated on the third Sunday of the month. Requesting the Sacrament of Baptism for a child involves a serious obligation and faith commitment on the part of the Parents and Godparents. We encourage parents to begin this process prior to the birth of their child. To schedule your baptismal preparation appointment, please call Deanna Thurlow at 287-2727, ext. 106. Parents must be registered and active members of the Parish for three months before beginning the baptismal preparation process. An “active member” is properly registered on the parish rolls, faithfully attends Mass on Sundays and Holy Day, participates in parish activities/ministries when possible, and uses the parish envelope system for donations. Parents and Godparents must attend a Baptismal Preparation Class. Our Baptismal Preparation Class is held the first Sunday of each month at 10:15am in the Pastoral Office Conference Room. Please call 772-287-2727, ext. 106 to RSVP for the class. At least one Godparent must be an active, registered parishioner, at least 16 years of age and Baptized and Confirmed in the Catholic Faith. They can be married or single. However, if they are married, they must be married in the Catholic Church. A Godparent Eligibility Form will be provided for Godparents to fill out, have signed by their Pastor, and return before the baptism. Baptisms will not be scheduled until parents and Godparents have taken the Baptismal Preparation Class and all paperwork has been turned in to the Parish Office, including the baptismal preparation form, copy of the child’s birth certificate, Godparent Eligibility Form (if applicable) and letter of permission from parents’ church of registration (if applicable). Completed paperwork should be turned in at least 3 weeks before the requested baptism date. Candidates for this sacrament are those already baptized and who have received formation in religious education. We celebrate Confirmation with the Bishop. For High School students, this is a 2-year program. Contact the Parish Office. Adults wishing to be confirmed can contact the Religious Education Office. First Eucharist is usually celebrated in the Second Grade after attending the required religious instruction classes either at St. Joseph Catholic School or through the Religious Education Program. First Eucharist for children takes place in the Spring. Please call the Parish Office for more information. A priest is available to hear confession on Saturday, from 11:00 a.m. to 11:30 a.m., from 3:00 p.m. to 3:30 p.m., and on Thursday before First Friday, from 3:00 p.m. to 3:30 p.m. Penitential Services are held during the Seasons of Advent and Lent. First Reconciliation is usually celebrated in the Second Grade prior to First Eucharist. Please call the Parish Office for more information or to schedule a time convenient for you. Wedding Masses are celebrated on Saturday, and may begin as early as 12:00 noon, but no later than 1:00 p.m. Engaged couples must be registered in this parish for a minimum of 6 months, attending Mass regularly, and participating in our envelope system before initiating the marriage preparation process, which requires approximately 6 months to complete. 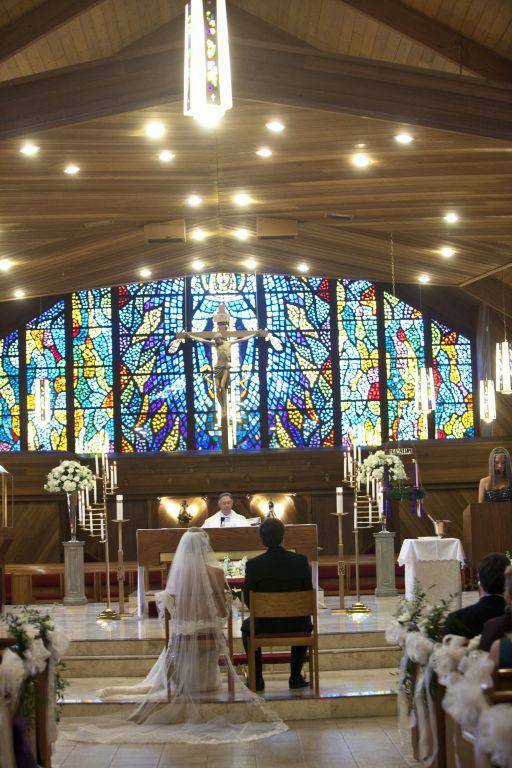 You must call the Parish Office at least six (6) months prior to your intended marriage to begin the marriage preparation program, and in advance of scheduling the wedding reception hall. Tentative wedding dates require meeting with a parish priest and his subsequent approval, before being confirmed/scheduled on the Church calendar. If you feel you may have a vocation to serve the People of God through the Ordained Ministry as a Priest or Deacon, or the Vowed Religious Life, please contact the Diocesan Vocation Office at (561) 775-9555 or speak to one of the parish priests. This Sacrament will be celebrated with a special Liturgy for the Sick twice a year, Lent and Advent, or in the case of immediate need, upon request. If you are homebound or in the hospital and desire to be anointed, please contact the Parish Office. When a patient is in the hospital, please ensure you register as a Catholic so that our Extraordinary Ministers of Holy Communion can visit you. We receive many requests for parishioners to be godparents or sponsors for the Sacraments of Baptism and Confirmation and to rightfully enjoy the number of services offered at St. Joseph Church. Part of the request is to be able to verify that a person is an “active member” of St. Joseph. We welcome you to come spend some quiet time with Our Lord in the Adoration Chapel, which is accessible via a combination entry pad. Please visit the Parish office to obtain the combination code. The Chapel is accessible 24/7. Cada Tercer Sábado de mes a las 11:00am tenemos los Bautismos y la charla Pre-Bautismal el Primer Jueves de mes a las 7:00pm en la Parish Life Center Room #2.. La celebración de este Sacramento pide a los Padres y Padrinos que asuman el compromiso de educar a sus hijos y ahijados en la fe cristiana católica. Como requisito, los Padres deben acercarse a la Oficina Parroquial a registrar a sus niños con tres meses de anticipación a la fecha del bautismo, asistir a misa por lo menos 6 Sábados antes del bautismo y anotar sus nombres después de cada misa con la persona encargada, estar registrados como miembros de la Parroquia, ser residentes del área de Stuart, Palm City o Hobe Sound y tomar la charla Pre-Bautismal junto con los Padrinos. Los niños que desean celebrar su Primera Comunión deben haber recibido ya el Sacramento del Bautismo y completar el Programa de Educación Religiosa de la Parroquia. Pueden iniciar el período de preparación desde el segundo grado escolar. El programa de Educación Religiosa comienza al mismo tiempo que las clases en las escuelas, es decir, en el mes de Septiembre. Favor inscribirse en la Oficina Pastoral de la Parroquia. El sacerdote está disponible para hacer confesiones los Sábados, desde las 11:00 a.m. hasta las 11:30 a.m. y de 3:00 p.m. a 3:30 p.m. y también los Jueves antes del Primer Viernes de cada mes desde las 3:00 p.m. hasta las 3:30 p.m. También puede llamar a la Oficina Parroquial y hacer una cita con algún sacerdote para su confesión. Las parejas que van a casarse por la Iglesia, deben ya haber tomado los Sacramentos de Bautismo, Primera Comunión y Confirmación. Los Matrimonios se celebran los Sábados a las 12:00m. y/o 1:00p.m. Las parejas deberán estar registradas en la parroquia, asistir a misa regularmente y participar del sistema de sobres de la Iglesia. Antes de comenzar la preparación pre-matrimonial, se necesitan por lo menos 6 meses para completar toda la preparación y recaudación de documentos. Antes de fijar fecha en el calendario de la Iglesia, deben las parejas tomar una entrevista con el sacerdote para su aprobación. Si tú sientes vocación de servicio al Prójimo y a Dios, y sientes que El te está llamando a ser Sacerdote, Diácono o Hermana Religiosa, por favor no dudes en llamar a la Oficina de Vocaciones de la Diócesis (561) 775-9555 o hablar con un Sacerdote de la Parroquia. Este Sacramento se celebra con una especial liturgia por los enfermos dos veces al año (Cuaresma y Adviento) o en caso de necesidad inmediata o porque alguien lo requiera en su casa u hospital, debes llamar a la Oficina Parroquial (772)287-2727. Quienes deseen celebrar sus Quince Años deberán cumplir los siguientes requisitos: haber recibido los Sacramentos del Bautismo y la Primera Comunión, estar en el programa de Preparación para recibir el Sacramento de la Confirmación, participar semanalmente en alguna de las Eucaristías de la Parroquia, Participar en un curso especial para Quinciañeras que se ofrece dos veces al año y su familia deberá estar registrada en la Parroquia. Deben ponerse en contacto con alguno de los Sacerdotes de la Parroquia con seis meses de anticipación a la fecha de la celebración.